SEOUL, Nov. 8 (Yonhap) — Lotte Shopping Co., the operator of South Korea’s biggest department store and a leading discount store — both under the Lotte name — shifted to a net profit in the third quarter from a year earlier on robust sales in overseas markets, the company announced Thursday. For the three months ending Sept. 30, the retail giant swung to a net profit of 208.04 billion won (US$186 million) from a net loss of 532.96 billion won a year earlier, the company said in a statement. “The quarterly results got a boost from strong overseas sales of fashion items and home appliance products at Lotte department store branches and increased sales at discount store branches at home and abroad,” the statement said. 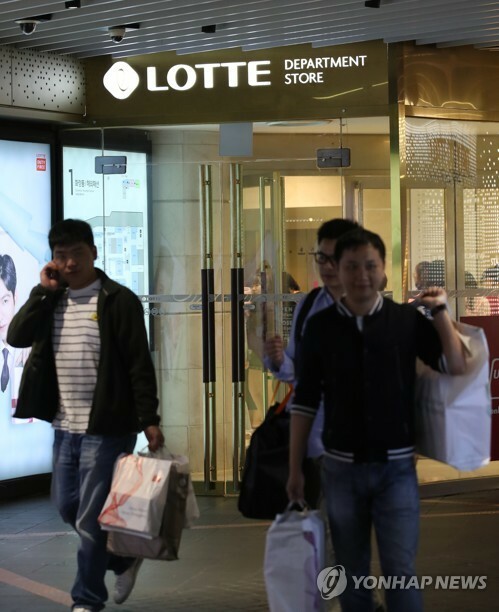 Lotte’s increased presence in Southeast Asian markets and its products’ competitiveness will further drive up earnings results in the fourth quarter, the company said. Operating profit rose 15 percent to 199.07 billion won in the third quarter from 172.64 billion won a year ago. Sales were up 2.5 percent to 4.675 trillion won from 4.563 trillion won during the same period. Lotte Shopping is a major affiliate of Lotte Group, a chemicals-to-retail conglomerate. Last month, Lotte Group Chairman Shin Dong-bin announced the company will invest 50 trillion won in new investment and create 70,000 jobs over the next five years. The announcement followed his release from jail after a Seoul appeals court suspended a bribery and embezzlement sentence for four years in early October.